For artists in the period before the modern era (before about 1800 or so), the process of selling art was different than it is now. In the Middle Ages and in the Renaissance works of art were commissioned, that is, they were ordered by a patron (the person paying for the work of art), and then made to order. A patron usually entered into a contract with an artist that specified how much he would be paid, what kinds of materials would be used, how long it would take to complete, and what the subject of the work would be. Not what we would consider artistic freedom—but it did have its advantages. You didn’t paint something and then just hope it would sell, the way artists often do now. Patrons often asked to be included in the painting they commissioned. When patrons appear in a painting we usually refer to them as donors. 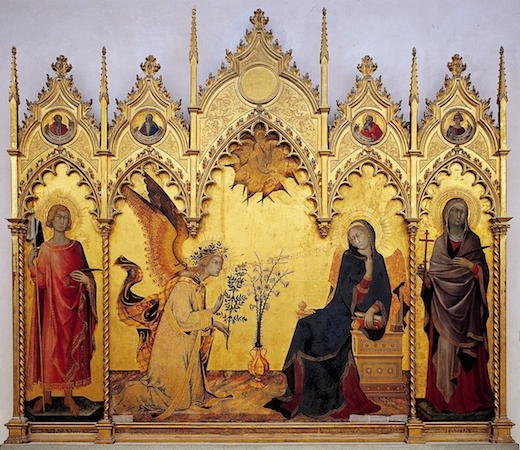 In this painting, the donor is shown kneeling on the right before the Virgin Mary and the Christ Child. 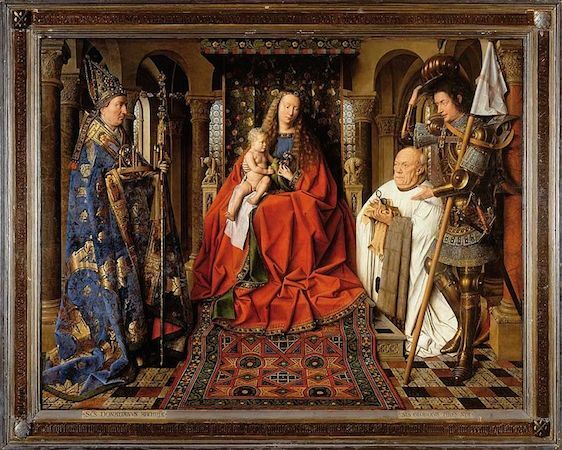 Jan van Eyck, The Virgin and Child with Canon van der Paele, oil on wood, 141 x 176.5 cm (including frame), 1434-36 (Groeningemuseum, Bruges). What was the status of the artist before the modern era? One way to understand this is to think about what you “order” to have made for you today. A pizza comes to mind—ordered from the cook at the local pizza parlor—”I’ll have a large pie with pepperoni,” or a birthday cake from a baker “I’d like a chocolate cake with mocha icing and blue letters that say ‘Happy Birthday Jerry. '” Or perhaps you ordered a set of bookshelves from a carpenter, or a wedding dress from a seamstress? Does our culture consider cooks and carpenters to be as high in their status as lawyers or doctors (remember we’re not asking what we think, but what value our culture generally gives to those professions)? Our culture creates a distinction that we sometimes refer to as “blue collar” work versus “white collar” work. In the Middle Ages and even for much of the Renaissance, the artist was seen as someone who worked with his hands—they were considered skilled laborers, craftsmen, or artisans. This was something that Renaissance artists fought fiercely against. They wanted, understandably, to be considered as thinkers and innovators. And during the Renaissance the status of the artist does change dramatically, but it would take centuries for successful artists to gain the extremely high status we grant to “art stars” today (for example, Pablo Picasso, Andy Warhol, Jeff Koons, or Damien Hirst). Medieval paintings were often sumptuous objects made with gold and other precious materials. What made these paintings valuable were these materials (blue, for example, was often made from the rare and expensive semi-precious stone, Lapis Lazuli). These materials were lavished on objects to express religious devotion or to reflect the wealth and status of its patron. Today the value of a painting is often the result of something entirely different. Picasso could have painted on a napkin and it would have been incredibly valuable just because it was by Picasso—art is now an expression of the artist and materials often have little to do with the worth of the art. Cite this page as: Dr. Steven Zucker and Dr. Beth Harris, "What made art valuable: then and now," in Smarthistory, August 8, 2015, accessed April 22, 2019, https://smarthistory.org/what-made-art-valuable-then-and-now/.